Scientists at the Stowers Institute for Medical Research have identified a physical basis for the spread of corrupted proteins known as prions inside cells. Their research findings are reported in the July 5, 2018, issue of the scientific journal Molecular Cell. Prions are proteins that can adopt distinct structural shapes that can propagate themselves to other proteins. Prions have been linked to age-associated neurodegenerative disorders such as Alzheimer's and Parkinson's diseases. However, recent studies have revealed that prions are also important for normal cellular processes including immune responses that fight off viruses. In their quest to understand what exactly makes a protein a prion, Stowers Assistant Investigator Randal Halfmann, Ph.D., and his lab members focused on the very first event of prion formation, known as nucleation. They designed a powerful novel cell-based fluorescence assay called Distributed Amphifluoric FRET (DAmFRET) to determine some of the key biophysical properties of nucleation for proteins expressed in baker's yeast cells. 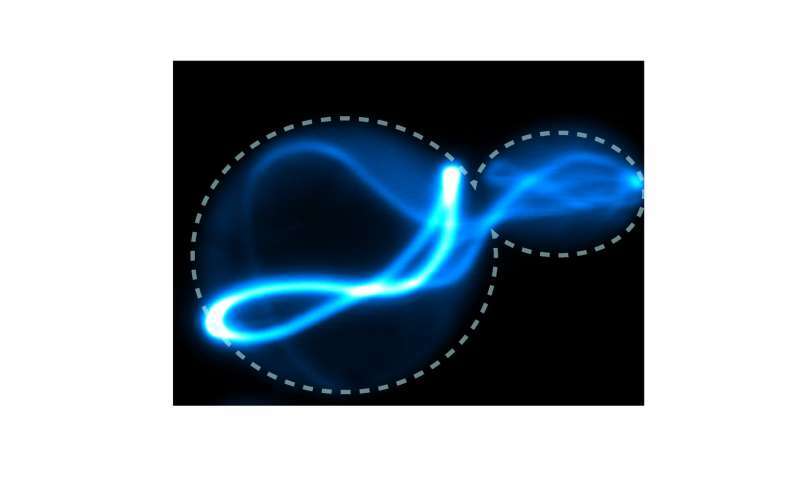 Halfmann and team members determined that the key property of prion-forming proteins that distinguishes them from other proteins is their ability to become super-saturated. "Unlike other proteins that began to aggregate as soon as they were sufficiently concentrated inside cells, prion forming proteins instead remained soluble, and only aggregated when very rare random fluctuations in a few molecules provided a template to do so," Halfmann said. Halfmann describes prion formation as similar to the action of a hand-warmer packet that produces heat to warm cold hands. The packets contain a water solution that is super-saturated with sodium acetate salt. Flexing a metal disc inside the plastic pouch arranges a few of the salt molecules into a crystalline shape. Nucleation—the creation of the first tiny crystal inside the hand-warmer—provides a template for all of the other salt molecules to crystallize. The energy released by the rush of molecules into the growing crystal generates the heat that warms cold hands. In the study, the researchers found that prion forming proteins are much like the salt crystals—they will eventually aggregate, but only in a very particular arrangement that only rarely happens spontaneously. "The probability that a critical number of the proteins spontaneously bump into each other in exactly the right orientation is very low," explained Tejbir S. Kandola, an Open University predoctoral researcher carrying out his thesis research with Halfmann at the Stowers Institute. Previous investigations of prions have been hindered by a lack of quantitative assays. Using DAmFRET, the Halfmann lab became the first research group to successfully measure the frequency of nucleation as a function of protein concentration inside cells. They are now using the approach to investigate how nucleation happens for prion-like proteins responsible for Alzheimer's and other brain diseases. Halfmann and his lab have been sharing the approach with scientists at other academic research centers. "Most labs do not have the equipment and throughput to use DAmFRET at our scale and resolution. So we are happy to collaborate with outside scientists by testing the proteins that they are investigating," Halfmann said. Other Stowers authors of the study include Tarique Kahn, Ph.D., Jianzheng Wu, Shriram Venkatesan, Ph.D., Ellen Ketter, Jeffrey J. Lange, Ph.D., Alejandro Rodriguez Gama, Andrew Box, Jay R. Unruh, Ph.D., and Malcolm Cook.